It’s a fact that women are not represented equally in the tech industry. 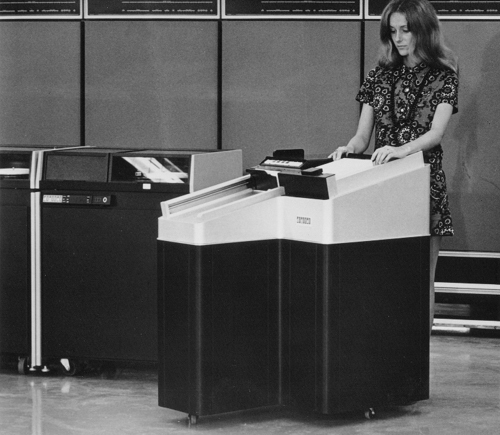 As of 2013 only 27% of computing occupations were held by women . And getting more women interested in computing careers is no easy task. At a young age, girls get discouraged from exploring computer science due to various stereotypes and others will try it out and leave, feeling like they can’t succeed. This is a pipeline issue; at each level from early education, college, to career, there are not enough women. While every level of this pipeline needs to be addressed, I am targeting change at the university level, using my reach on campus at Trinity University to take action. Since the mid 1980’s there has been a decline in the number of female computer science majors. As of 2012, only 18% of computer science majors were female . Many women take their first computer science classes and decide the field isn’t right for them. At Stanford in 2012, the percentage of women in their introductory computing classes decreased with each continuing course in the sequence. The first class (CS106A) was 40% female, the next (CS106B) was 30% female, and the third course (CS107) was just 20% female . The percentage of female computer science majors that year was even lower, at 12% female . There are three main attributes said to correlate to this drop off in female interest: isolation, lost interest, and lack of role models . This research goes hand in hand with our knowledge of how macho environments and overly stressful classes deter women as well. In order to combat this, many schools have redesigned their introductory computer science courses. Harvey Mudd is a great example, as they made a few impactful changes to tweak their curriculum and saw great results. First, they switched to Python, a more forgiving programming language than some of the alternatives like C++ or Java that also has lots of use in industry . Second, they tried to combat the macho culture by dividing the courses into groups based on experience level. They now have CS5 Gold for new programmers and Black for those with prior AP level computer science experience . Third, they made gave students choice in their programming assignments by offering different options of implementation to appeal to different students . For example, one could choose a biology application over a physics one, but both would learn the same computer science skills. While these were the main overhauls to the curriculum itself, they also have extracurricular factors that contribute to their success, like a large women in computing club and every year Mudd takes many of its female first year computer science students to Grace Hopper, an empowering conference for women in computing . After implementing these changes, Harvey Mudd got their rate of female computer science majors from 10% to 40% . While we may not be able to enact every change exactly as Harvey Mudd has, many other schools have followed their example and I hope to push Trinity to do the same. Currently, the introductory computer science class for majors at Trinity is CSCI 1320. There are a lot of great things already happening at Trinity to make our course accessible to everyone. Just like at Mudd, we have options of implementation on our assignments. We also have small classes sizes, which help students feel open to asking questions in class. However, we can still make great strides to make our course better for beginning programmers. Following the model of Mudd and others, I am suggesting the following changes be made to the course in order to create a more inclusive environment and attract, as well as retain, more women: splitting the intro course into groups divided by skill level, adding opportunities for collaborative learning, and offering good faith credit on some assignments. When students with no experience are placed in the same class as those with a lot of prior knowledge, they become discouraged. Often times, this leads to students, especially women, believing programming is an inherent ability that they can’t possibly learn. While this is far from the truth, these feelings of self doubt are reinforced by the macho environment. Thus, I propose dividing the course into two sections, 1320 White and 1320 Maroon. The classes would essentially be the same, teaching the same curriculum by the end of the semester, however 1320 White would start at a slightly slower pace in order to reinforce the basic principles of computing while 1320 Maroon would extend into some more detailed applications to challenge the already experienced students. By giving the beginner programmers more time to understand the basics, they can move forward with their computer science curriculum with more confidence. The second change I am suggesting for the intro course is to add opportunities for collaborative learning. As the Stanford study showed, isolation was one of the three identified causes for students leaving computer science. Mudd has helped alleviate this by having some assignments be pair programming, where students work in teams of two to three and work together to create a solution. Doing this can help students find community and lessen the feelings of isolation. Furthermore, the students would get the benefit of learning with and from their peers though these group assignments. Lastly, I think implementing a good faith credit system could greatly aid our into course. With programming, it’s often that you can start an assignment with all of the intentions to get it finished and put in hours of work, but one small bug can prevent you from getting a correct solution. By implementing a system where students can earn partial credit for working hard on assignments despite getting an incorrect solution could greatly improve morale. Students, especially women, often take grades very seriously. Where a B may not be detrimental, these lower marks can be a determining factor in why women leave computing. By incentivizing hard work, success can become the norm in the intro class, thus rewarding those who put in the effort and encouraging learning over absolute correctness. I would like to note, that one change I am not immediately suggesting is a switch to a new programming language, like Python. While such a switch could be beneficial, as it was a Mudd, changing the curriculum to a new programming language is no easy task. And in order to make change quickly on campus, I am leaving the argument of programming languages aside. That said, Scala is a fairly user friendly language, used by industry leaders like Twitter among others. While it might not be as popular as Python, it has worked well for Trinity and thus remains in my proposal. In all, I feel that with these three changes, the computer science department at Trinity will see better retention of female majors as well as see the intro course being a better experience for all students. These proposed changes are also going to be presented to the department in a meeting next spring, hopefully getting turning these suggestions into plans of action. With Mudd and others leading the charge, proving how small curriculum changes can make a big difference, I am confident we can see positive change right here at Trinity and do our part to help close the gender gap in tech. 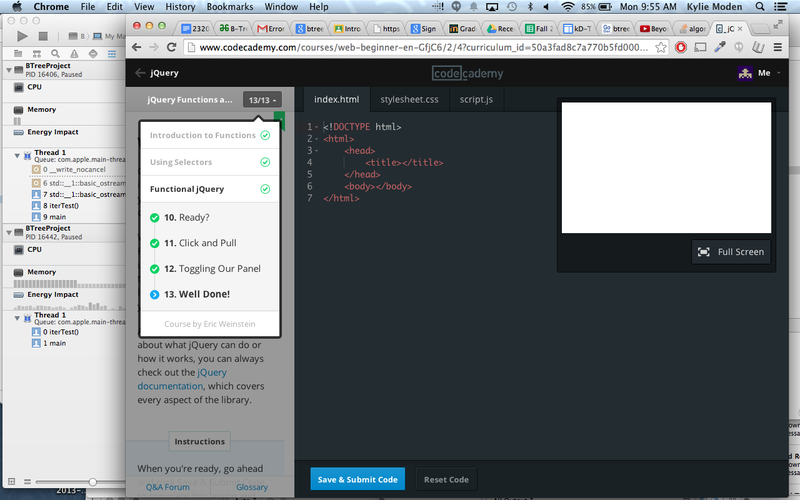 For this coding experience, I decided to play with JQuery, another web development language you can learn about on Codecadmy. I loved the interactivity and the simplicity of the language. Spending time with this website was such a happy reunion. I encourage everyone to join Codecadmy and start learning today. You might even find yourself enjoying it so much that you will end up finishing the lessons in no time! Computing is a huge industry in the U.S. with lots of potential. The Bureau of Labor Statistics estimates an 18% increase in projected employment, which translates into 1.2 million job openings by 2022. However, women only make up a fraction of the computing workforce. In 2013, women represented 57% of professional occupations but only made up 26% of such occupations in computing. What gives? We have heard many possible explanations, however I argue that one of the larger issues is a lack of computer science exposure in education. In today’s digital age, every profession uses computers in come way, but that reality is not being translated to schools. Not a single state in the US requires a computer science course in order to graduate despite many educational studies calling on secondary schools to take such action. Fourteen states don’t offer any upper-level computer science instruction whatsoever. The Association of Computing Machinery has called on the nation to implement computer science in schools arguing that it will help us in turn grow economically. I fully support this initiative and further argue that in order to get more women in computer science, early exposure to computer science in school will help change the current outlook. So, how exactly does computer science education help get more women into a male-saturated field? Early exposure shows girls what computer science is all about and shows them that it can be learned. If students realize that computer science is not an innate ability, girls are especially more likely to think they can succeed in it. I believe we have failed a generation of girls by not introducing them to the world of computer science, where creativity and code can translate into real world solutions. If girls fall in love with computing early, in middle or high school, I doubt any silly bro-culture stereotype could sway them from entering such an amazing field. Bureau of Labor Statistics, U.S. Department of Labor, Occupational Outlook Handbook, 2014-15 Edition, Computer Programmers, on the Internet at http://www.bls.gov/ooh/computer-and-information-technology/computer-programmers.htm (visited September 19, 2014). National Center for Women and Information Technology, By The Numbers, on the Internet at http://www.ncwit.org/sites/default/files/resources/btn_02282014web.pdf (visited September 19, 2014). Association for Computing Machinery, Running on Empty: Computer Science in the Digital Age, on the Internet at http://runningonempty.acm.org/fullreport2.pdf (visited September 19, 2014). Schwartz, Katrina, Giving Good Praise to Girls: What Messages Stick, MindShift, on the Internet at http://blogs.kqed.org/mindshift/2013/04/giving-good-praise-to-girls-what-messages-stick/ (visited September 19, 2014). Keypunch girls, like the one depicted here, translated code instructions onto punched cards which were then run by a card reader machine, such as the Crioe machine from this picture. This created a division of labor where men waited for their ideas to be “coded” and women were stuck in this low level job. Read more about the days of early women programmers here. You can find this image as an artifact at the Computer History Museum, catalog number 102630584. For more information visit their website. 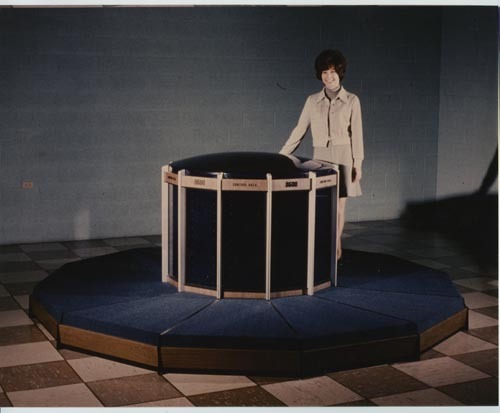 The Control Data Corporation released this mockup for the CDC 8600 supercomputer in the 1970’s, however it never came to fruition and was canceled in 1974. We see here, once again, the woman being used as a prop rather than being actively engaged in the technology. 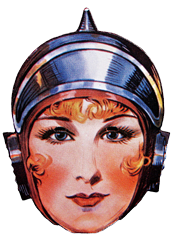 Read more about women being used as props in computing ads here. You can find this image as an artifact at the Computer History Museum, catalog number 1026227358. For more information visit their website. This black and white image dated from 1970 was used to publicize the PDP-8/E minicomputer, advertised to fit in a small office. Here we see a woman as the user of the device, however note that in this time women were often regulated to more clerical code work. Read more about these computer girls here. You can find this image as an artifact at the Computer History Museum, catalog number 102619005. For more information visit their website.